Malaysia Airlines Business Class Passenger Nabbed While Stealing From Carry-On Baggage – Watch Your Belongings! A Malaysia Airlines passenger publicly posted on Facebook (MH Facebook Group) today that he caught a fellow Business Class traveler red-handed stealing from his carry-on which had been stowed in the overhead bin. The carry-on had been removed by the criminal and taken to his own seat during the boarding process – unfortunately for the thief, the victim wasn’t traveling alone and a colleague notified him that his bag had been removed. Carry-on baggage theft and pilferage has become a popular target for criminals in recent years and occasionally we hear about these cases in the media. More often than not these incidents seem to occur on flights in Asia (especially China), and in this particular case it was a Malaysia Airlines flight from Ho Chi Minh City, VN to Kuala Lumpur, MY. You can access the public post on the Malaysia Airlines Facebook Group here. I was on the short flight MH0751 from Ho Chi Minh City flying back to KL on 15/8/18, a working trip with my four business partners. After putting in my laptop bag in my designated overhead cabin, I settled in my seat on the 2nd row, minding my own business. One of my partners who sat behind me noticed a fellow passenger taking my bag which he brought to his seat on the 4th row. My partner alerted me to check on my bag and true enough it was gone. I went to the man’s seat and caught him off guard going through my bag and his left hand holding some of my foreign notes currency (EURO and USD, which I am 100% sure are mine), looking like he was about to keep them in his pocket. I confronted him with the rest of my partners surrounding us. I did a thorough checking of my bag, because MY BIGGEST CONCERNS were my traveling documents (passport etc.) and whether he had implanted any illegal items, in an attempt to use me as his transporter (read: drug mule syndicate). We then alerted the stewardess who was quick to take the necessary actions. Fortunately the man didn’t become aggressive and this all happened before take off (during the busy period of passengers boarding the flight). Security and police were called in, report was made, the pilot and crews declared the flight was not safe to take off until the man is taken off the flight. He was then forced to depart off. Apparently, the crew informed us, there is a syndicate that has been conducting this modus operandi on China, Hong Kong and Vietnam flights. That guy was from Hong Kong and he is flying to KL with no return ticket, probably his route depends on his “loot”. He also advises other passengers to be careful with their carry-ons and try to not leave them out-of-sight which is definitely a good reminder. I have to give the passenger huge credit for apparently being calm and not engaging in any physical confrontation with the thief once he caught him going through his stuff, stolen cash in hand. The crew was also very professional and obviously trained in handling these situations in a de-escalating manner before a fight breaks out on board. 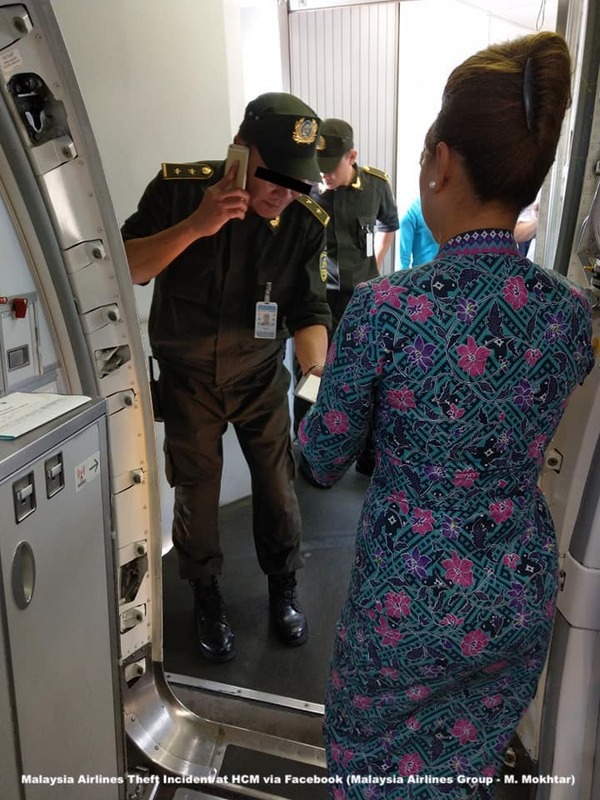 Since this happened during boarding the criminal (who apparently was from Hong Kong) was able to be handed over to the to the local Vietnamese authorities. Not a fun place to go to jail for sure. I am glad the passenger had his valuables recovered! It’s very hard to prove anything after everybody left the aircraft and if you notice something was stolen upon landing, notify the crew immediately because the only way to resolve the case is to call in the police and don’t let anyone off the plane. That won’t make you popular but there is no other way. As soon as criminals notice something is going on they usually try and dispose of their loot immediately in washrooms, trash cans or seat pockets. I had it happen once during a flight from Frankfurt to Detroit where my wallet was missing and probably got lumped together with another passengers stuff in an empty middle seat. Sure enough the lady had it in her bag, but back then I felt this was an innocent mistake rather than intentional theft. I could be wrong but I got my wallet back so I didn’t care. As I said it’s hard to prove and she hastily searched everything and was visibly shocked when the wallet was indeed in her bag. Since that incident I guard my valuables with an eagle eye. Good that this has been made public and it shall serve as a strong reminder to indeed try and keep carry-on baggage closed up safely and nearby. Also any cash and travel documents should be on your person at all times, not allowing access to them by third parties. Sometimes the overhead bins are full and the flight attendants ask you to stow it far away. This is the worst you can do if there is anything valuable in your baggage, especially if the bag is easily accessible through outside zippers and pockets.